Hardening or precipitation hardening is a process which can be used to cause changes in the properties of certain alloys solely by means of heat treatments. Precipitation hardening is the most important method for hardening alloys for which allotropic conversion, such as with steel, is not possible. These include most non-ferrous metal alloys, in particular aluminum alloys. The strength-increasing effect is based on the blocking of defects in the lattice structure (see Lattice defects), so-called dislocations, migrating under load. Precipitations are generated when a homogeneous solid solution is cooled, passing a phase line in the phase diagram. The targeted creation of precipitations is done by quenching a homogeneous solid solution, leaving it in a homogeneous but supersaturated state at low temperatures, even though it should be present in a two-phase state at these low temperatures according to the phase diagram. In this condition, diffusion is not yet sufficient to separate the solid solution. 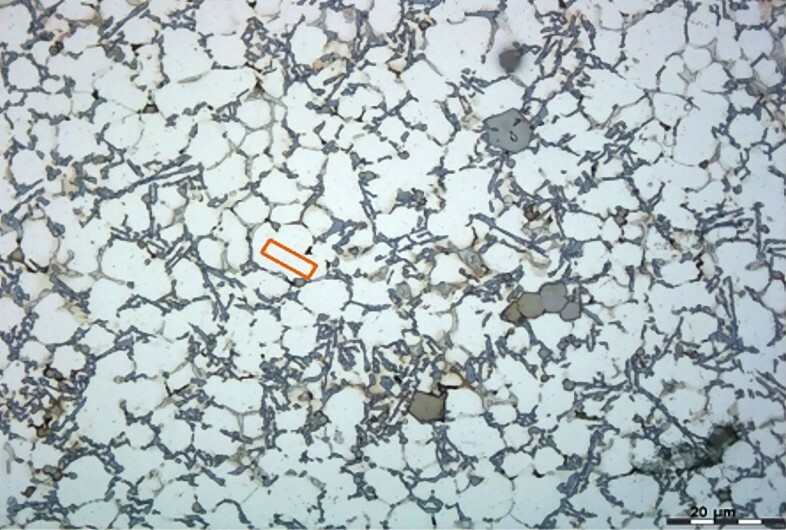 In the course of a subsequent heat treatment at a medium temperature level, diffusion increases and the solid solution can separate into the two phases defined by the alloy system. The resulting precipitations are separated from the matrix by phase boundaries. Fig. 1 shows a possible process for creating precipitations from a lead solid solution in the Sn-Pb system. The phenomenon of aluminum alloy hardening was already discovered by A. Wilm more than 100 years ago on an Al-Cu-Mg alloy  and has ever since been subject to intensive studies for a variety of alloy types. The hardening is based on separation processes occurring in the supersaturated solid solution at room temperature or moderately elevated temperatures . The separation processes take place when the aluminum-rich α-solid solution exhibits solubility for a certain alloy component which decreases as the temperature sinks; they are controlled by diffusion and therefore dependent on time and temperature. Hence, in addition to a system of decreasing solubility, the formation of a supersaturated solid solution mainly requires high cooling rates, as present in gravity or pressure die casting, or that the castings should cool down as quickly as possible upon removal from the permanent mold which is usually accomplished by immersing the castings into a quenching medium (normally water at room temperature). This process is called quenching from casting heat. During heat treatment, the castings are quenched in a water bath following solution annealing. Quenching using slightly lower cooling rates in temperature-regulated liquid media, in air or by spray cooling is possible to avoid distortion; however, subsequent artificial aging will no longer result in the full hardening potential. The strengthening effect is based on the formation of precipitations and therefore the blocking of defects in the lattice structure, so-called dislocations, migrating through the lattice under load. For precipitations generated by artificial aging, we refer to the detailed studies performed by Ashby et al. . Copper-based hardening which is essential for the strength of Al-Cu and Al-Si-Cu alloys is briefly described and summarized in the following. For alloys of the type Al-Cu and Al-Si-Cu, the supersaturated aluminum solid solution is the initial state for the formation of strength-increasing particles. 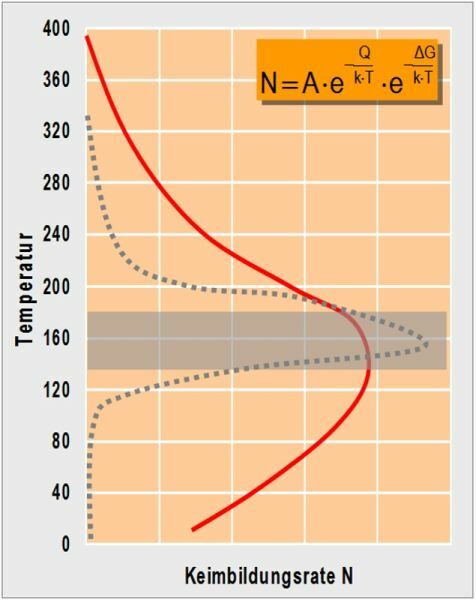 The dependence of solubility on the temperature can be seen in the binary system for aluminum-copper (Fig. 2). 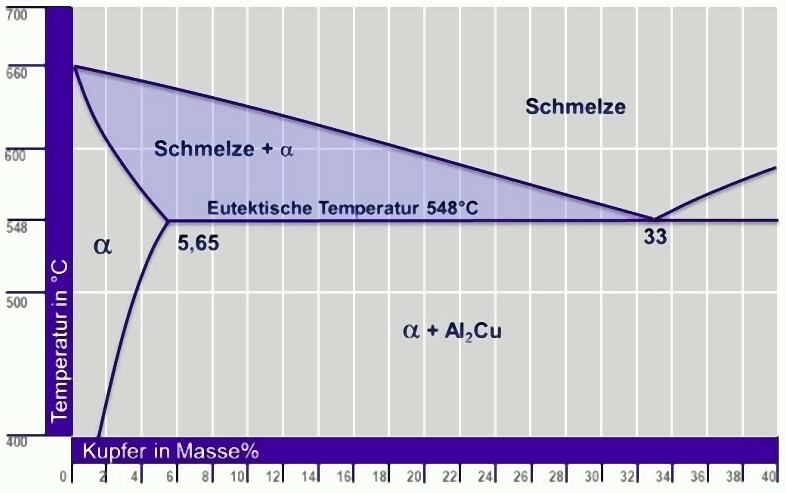 The maximum solubility of copper in the aluminum solid solution decreases from 5.65% at 548°C (Al-Cu eutectic) to less than 1.5% at 400°C. Al2Cu (Θ-phase) is the equilibrium stage. In this meta-stable state, thermal energy is supplied to the alloy during subsequent artificial agent, causing the material to reapproach the equilibrium state. However, this does not immediately result in the stable precipitation Θ (Al2Cu), but in a so-called precipitation sequence of different ordered sections at a certain aging temperature depending on the aging duration or in the formation of further meta-stable precipitations. If the single-phase GPI separations are briefly heated to 100°C to 200°C, they dissolve. They are then replaced by Guinier-Preston zones of the second kind (GPII zones). 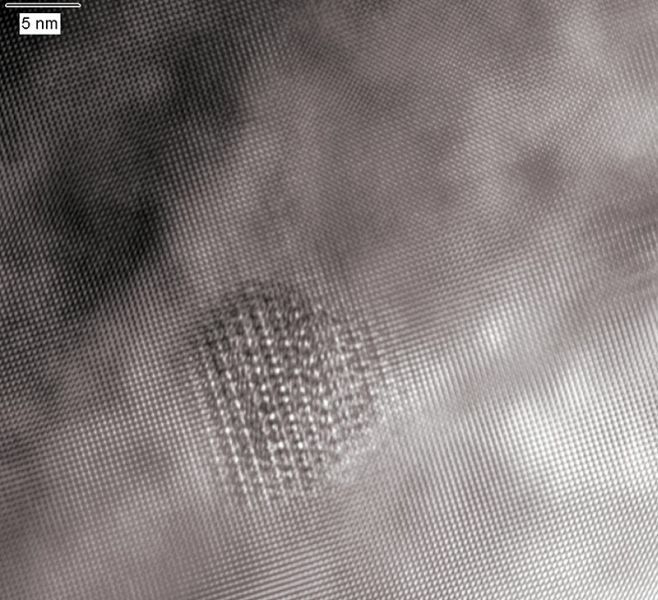 These also have a flaky structure and are coherent with the aluminum lattice. What has also been observed with respect to aluminum-copper alloys is that magnesium in particular can also accelerate the formation of GPII zones during artificial aging  which was confirmed by the results of TEM examinations. In contrast to the slow cooling described above, this precipitation sequence does not only occur at the grain boundaries but is also evenly distributed throughout the entire grain volume. The degree of the strength increase caused by precipitation hardening results from the interference of dislocation movements throughout the various stages of the precipitation sequence. Dislocations can overcome small, coherent particles by shearing (Friedel effect) and large, incoherent particles by bowing out (Orowan mechanism). Therefore, short aging times (presence of GPI zones, small coherent particles), i.e. intermediate storage or natural aging (but also in case of underaging), only result in a low increase in the 0.2% yield strength. Similarly, yield strength is also low at long aging times (with Θ’ or already stable Θ phases, large partly coherent or incoherent particles, prevailing), the so-called overaging, due to coarsening of the precipitates [7, 8, 9]. Maximum yield strength (and also hardness) can be observed where GPII zones emerge or at the beginning of the formation of Θ’ phases having maximum resistance to both shearing and bow-out by dislocations thanks to their size and coherency stresses. This state is usually sought during precipitation hardening of aluminum alloys with the aim of obtaining high strength . This yields groups of curves which are characteristic of strength properties as a function of artificial aging temperature and aging time, as shown in Fig. 6. However, when using these curve shapes as a basis it is assumed – for reasons of simplicity – that there is only one type of precipitation. In practice, several meta-stable phases follow each other, rendering these relationships more complex. Studies of the casting alloy Al Si9Cu3(Fe) [7, 8, 9, 10] resulted in the groups of curves shown in Fig. 7. 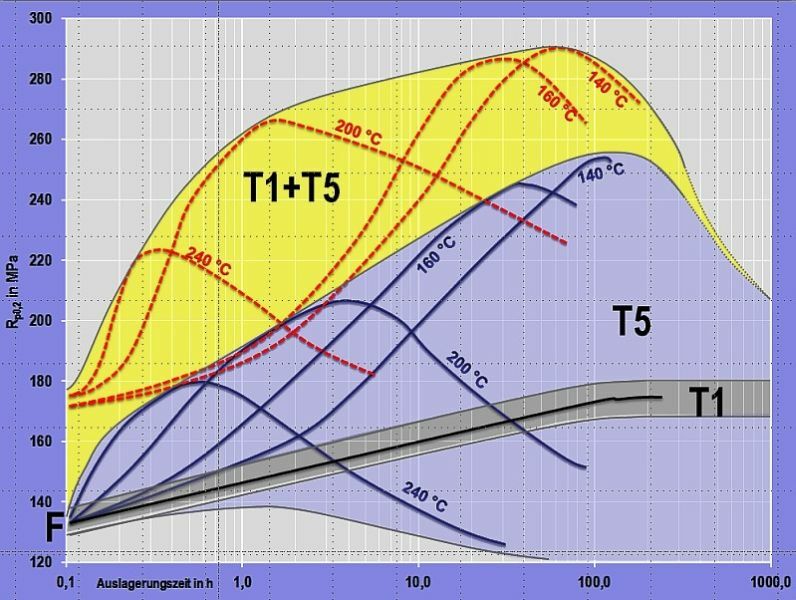 As described above, the aging curves follow a certain scheme: there are temperature- and time-dependent hardness and yield strength maxima with a good correlation between hardness and yield strength values. In the event of long artificial aging times, the values of these properties will decrease again due to overaging. This means that the higher the temperature of the casting is after removal from the die casting mold and thus the temperature difference obtainable through cooling and the faster cooling takes place after demolding, the larger is the precipitation potential and therefore the nucleation rate of precipitation clusters. (see Fig. 8). It includes the alloy constant A and the activation energy for diffusion Q. The curve exhibits a temperature-dependent maximum nucleation rate depending on the type of alloy. If the alloy-dependent constants and activation energies are known, an optimum temperature range for artificial aging can be determined and selected. Another important aspect for increasing strength is the conversion of Guinier-Preston zones into the partly coherent, meta-stable phases Θ’’ and Θ’ and, to a lesser extent, into the stable equilibrium phase Θ. 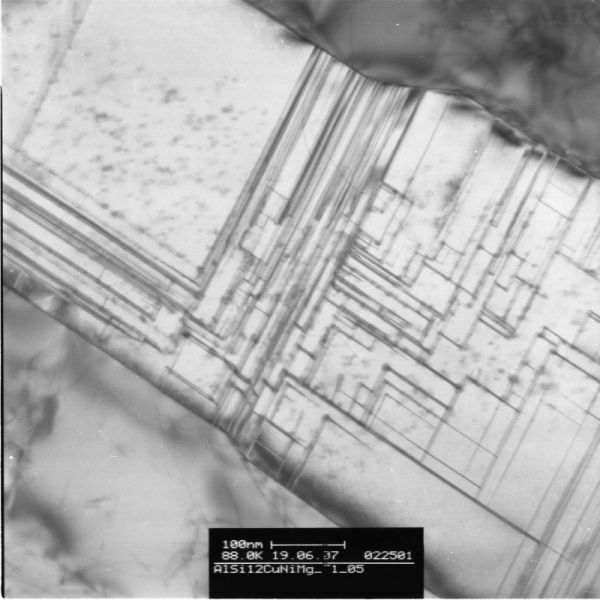 For examinations using TEM, specimens of the aluminum solid solution, similar to what can be seen in Fig. 9, with a cross-sectional area of approx. 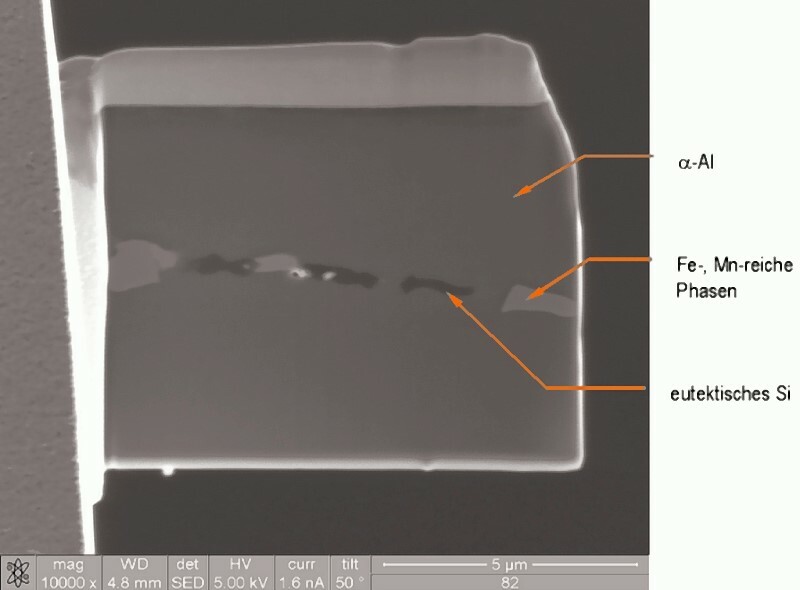 30µm2 were taken from die-cast rods made of Al Si9Cu3(Fe) alloy by means of a focused ion beam. 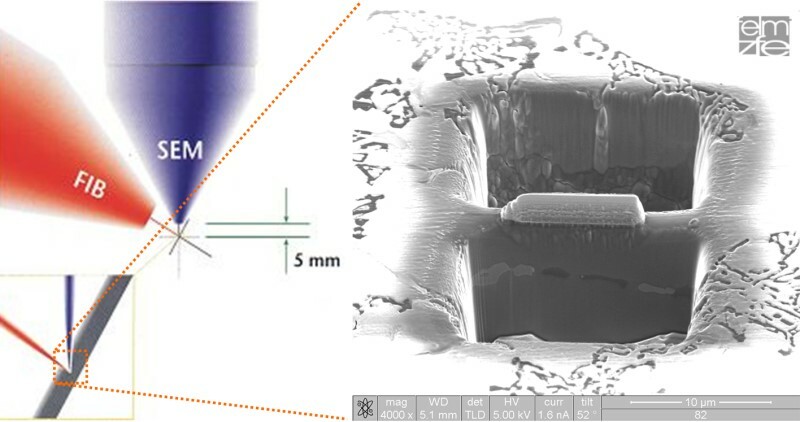 The TEM lamellae required for the examination were cut free by removing test material using a high-energy gallium ion beam, as schematically illustrated in Fig. 10. 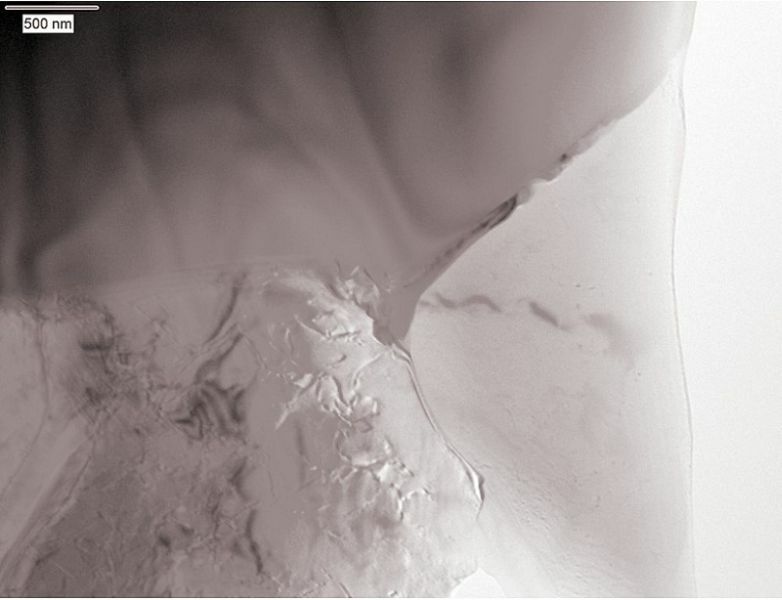 Afterwards, the exposed TEM lamellae were mounted onto a specimen holder and conventionally thinned . Fig. 11 shows a lamella mainly consisting of the aluminum-rich (α-Al) solid solution fixed to the carrier material. The specimen is interspersed with some eutectic silicon particles as well as phases rich in iron and manganese. Immediately after casting, the α-Al solid solution is virtually free of precipitations and supersaturated, which is also illustrated by the bright-field TEM image shown in Fig. 12. In contrast to natural aging, large incoherent precipitations are formed at higher temperatures as these require more energy for forming the phase boundaries than coherent precipitations. In addition, diffusion is accelerated at elevated temperatures which is associated with particle coarsening. Therefore, the highest strengths are expected to be obtained with incoherent precipitations in the range of 10 to 40nm as they interfere with dislocation movements most effectively: in this case, the shearing and bowing out of the precipitations are equally probable and, in addition, the phase boundaries of the incoherent precipitations are hard to overcome by the dislocation – this is why both mechanisms lead to an increase in strength  (strengthening mechanisms). shows such a solid solution which is rich in precipitations as result of artificial aging at 160°C. As an example, a semi-coherent Al2Cu precipitation of approx. 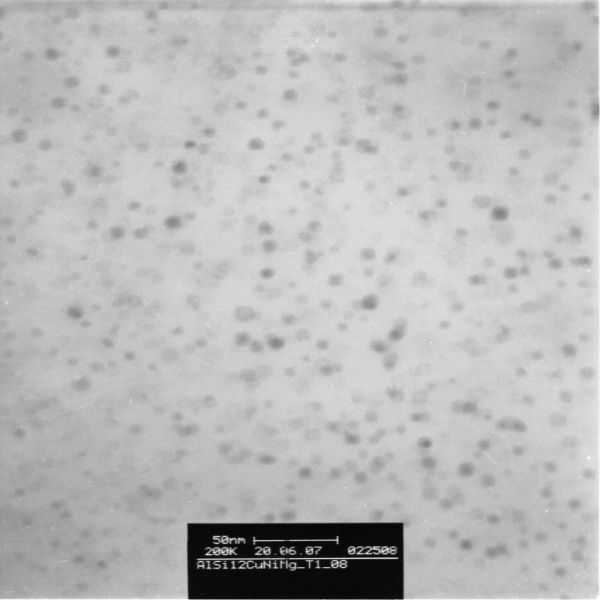 15nm can be seen in the high-resolution TEM (HRTEM) image in Fig. 14. 2 Aluminium-Taschenbuch, volume 2, Aluminium Verlag, Düsseldorf 1999, 15th edition. 4 J. M. Silcock: J. Inst. Met., Vol 89, 1960, p. 203-210. 5 E. Hornbogen, H. Warlimont: Metallkunde, Aufbau und Eigenschaften von Metallen und Legierungen; 4th edition, Springer-Verlag, Berlin, Heidelberg, New York, 1991. 6 W. Sha, Z. Guo, Quantification of precipitate fraction in Al-S-Cu alloys. Materials Science Engineering A 2005 (392), p. 449-452. 7 H. Rockenschaub, T. Pabel, G. Geier, M. Hopfinger, “Beschleunigung der Auslagerungsvorgänge der Druckgusslegierung Al Si9Cu3(Fe) bei gleichzeitiger Erhöhung der mechanischen Eigenschaften – Teil 1”, Druckguss-Praxis, 3/2005, p. 95-104. 8 T. Pabel, H. Rockenschaub, G. Geier, M. Hopfinger, G. Kothleitner, “Beschleunigung der Auslagerungsvorgänge der Druckgusslegierung Al Si9Cu3(Fe) bei gleichzeitiger Erhöhung der mechanischen Eigenschaften – Teil 2”, Druckguss-Praxis, 4/2005, p. 137-146. 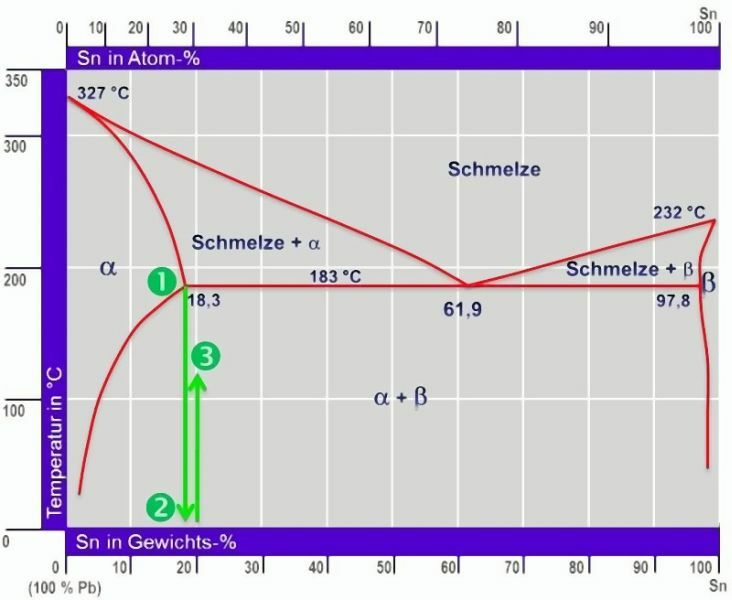 9 G. Geier, T. Pabel, H. Rockenschaub, M. Hopfinger, “Improved mechanical properties of the high pressure die casting alloy Al Si9Cu3(Fe)(Zn) as a result of the combination of natural and artificial ageing”, International Journal of Materials Research, Volume 98, 6/2007, p. 516-520. 10 T. Pabel, H. Rockenschaub, G. Geier, M. Hopfinger, “Auswirkungen einer Kombination von Kalt- mit Warmauslagerung auf die mechanischen Eigenschaften der Druckgusslegierung Al Si9Cu3(Fe)(Zn)”, Druckguss-Praxis 01/2007, p. 33-41. 11 O. Kessler, Ausscheidungshärtung von Aluminium-Legierungen, Der Wärmebehandlungsmarkt 3/2001, p. 5-8.